The La Crosse County Democratic Party has a Medicare for All campaign going on locally. Get involved! Pick up info at their HQ, 115 Fifth Ave South, or at the fair through Sunday afternoon or email the co-chairs. Progressives within the party are making a difference. The Unity Reform Commission recommendations, including weakening the power of "super delegates" to skew primary results, are on the path to approval. New progressive candidates are showing strength across the country. National Dem legislators are getting more forcefully behind progressive programs (most of which supported by a majority of Americans, don't forget). This is happening in part because of strong issue oriented organizations and in part because hundreds and thousands of progressives have joined the Dem party, run for party offices, moved progressive priorities, and recruited and supported progressive candidates. Ground up institutional changes do not happen in a hurry. And they don't happen if change-makers get discouraged when the traditional power base pushes back. It's a there and back again, long, hard, frustrating, rewarding, necessary quest. And every one is needed. They have the money but we're supposed to have the people. Do we? 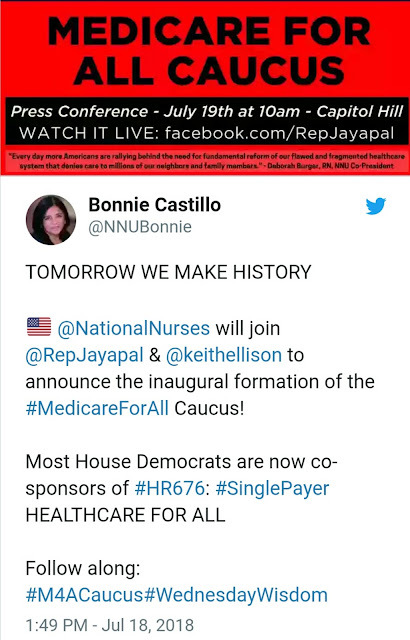 Let's show up now for Medicare for All, retaining Democrats in the US Senate (it is possible to take power from the regressives currently in power), more diverse progressive candidates, more people centered legislation, and a more sustainable future. Show up outside AND show up inside.